……The target of this application is Carter W. Page, a U.S. person, and an agent of a foreign power, described in detail below." Well, that which is described in the document is all about Page’s doings in international energy policy meetings and forums, which is not surprising because that was his academic and business field of endeavor. But in no way, shape or form is it about the theft or compromise of military secrets, which is the only possible justification for governments to spy on their own citizens. So let’s cut to the chase. Since Carter Page self-evidently had nothing to do with military secrets, officials of the Obama Administration had no excuse whatsoever for wiretapping him – even if he had been a paid energy advisor on Vlad Putin’s personal payroll. By wantonly infringing upon his constitutional right to free speech at home and abroad, therefore, Obama officials committed the gravest possible assault on American democracy: They misused the vast machinery of national security to meddle in a presidential election for partisan advantage – an heinous action which cuts right to the quick of democracy’s survival in America. 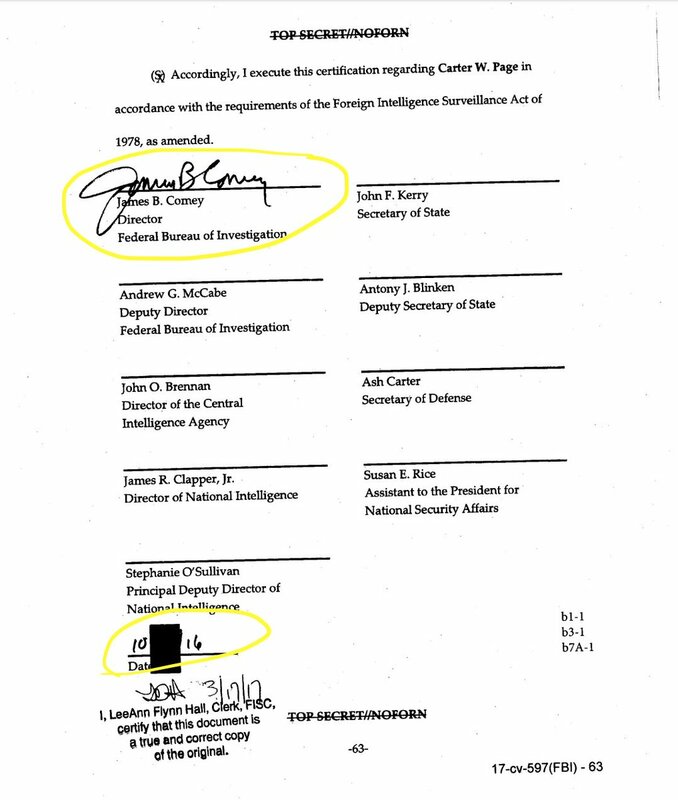 Indeed, the FSA application – slathered in blackout ink as it is – proves that the real meddlers in the 2016 election are the names listed below who signed the originally approved application. That is, the very top tier of Obama’s national security team including John Brennan, Susan Rice, James Clapper and the secretaries of Defense and State. That’s because the case against Carter Page is so bogus and thin that their only purpose for the wiretap was to set up a listening post in the Trump campaign. The aim of the latter, of course, was to spy on other higher-up advisors and possibly even Trump himself – and for the ultimate purpose of disrupting his campaign and defeating his candidacy. If that smacks of a preventative Deep State coup – it was. After all, spying on the campaign of the nominee for President of one of the two major political parties could be justified only by the very gravest evidence that the candidate was a secret agent of an avowed and dangerous enemy of America. Neither pertained in this case. When the first FISA application on Carter Page was submitted in July of 2016 (and rejected by the court) the Intelligence Community (IC) had nothing on Trump except the unverified and ridiculously salacious initial reports of the so-called Steele Dossier. Likewise, by any reasonable reading of the evidence Russia was an uncooperative adversary of US foreign policy. But it was not a mortal enemy or existential threat to the homeland by any stretch of the imagination – and therefore one that would justify extraordinary intervention in the election process by the national security machinery of the state. Instead, what Brennan & Co. actually objected to was a twofold complaint that is simply outrageous as justification for launching what amounts to a fishing expedition in the Trump campaign through a tap on Carter Page’s phone. First, and most outrageously, they found Donald Trump so personally distasteful that they took it upon themselves to assault the very essence of America’s constitutional democracy via an "insurance policy". That is to say, as the Peter Strzok/Lisa Page text messages make abundantly clear, the real reason for the FISA warrant was to generate dirt and calumny to stop, if need be, even the remote possibility that Trump might be chosen by the electorate. Beyond that, Trump was openly advocating an abandonment of Obama’s rapidly escalating Russian confrontation policy in favor of an attempt at rapprochement with Putin based on the Donald’s brimming confidence in his own prowess at the Art of the Deal. By whatever manner Trump might have come to his conclusions about Russia policy, it was a valid alternative to be decided by the electorate – not a mortal threat to national security that warranted a surreptitious attack on his candidacy by the Deep State. At bottom, the motivation for using Trump’s completely justifiable openness to a Russia policy of rapprochement rather than confrontation as the basis this unprecedented Intelligence Community (IC) assault on the nation’s constitution and election machinery was truly frightful. To wit, the Obama national security apparatchiks were nearly rabid with petty spite against a foreign leader who had countermanded their efforts at regime change in Syria and NATO expansion in eastern Europe. As we described at length in Part 2, Washington had turned on Putin with malice aforethought after he adroitly and constructively defused the Syrian chemical weapons canard in 2013 and justifiably came to the defense of Russian speaking populations in Crimea and the Donbas in 2014 after the US fostered coup by anti-Russian nationalists and crypto-fascists in Kiev. Yet for these alleged transgressions against the writ of the Empire, Putin has been virtually turned into the Devil Incarnate by official Washington; and any American who has come within a country-mile of his allegedly sulfurous vapors is now apparently fair game to be accused of being his sinister agent. If that is not the equivalent of 21st century witchcraft, we do not know what is. And if the banshees of the MSM and Dem apparatus screeching about Trump’s "treasonous" behavior in Helsinki are not the equivalent of the nine- and twelve-year-old girls of Salem Massachusetts who brought 19 alleged "witches" to the gallows for being agents of the Devil, we are hard-pressed to think of another explanation for today’s sheer hysteria in the Imperial City. After all, any one in possession of even a modicum of adult reasoning should be able to see that there are two sides to the Syria and Crimea story. Accordingly, Washington’s retaliation policy for both alleged offenses – slapping "sanctions" on certain Russian officials and businessmen – was not an utterly necessary measure of national self-defense against an existential threat. To the contrary, the Russian sanctions were recently minted and thoroughly debatable and reversible policies of a President whose term was expiring. They had nothing to do with protecting military secrets, the vital security of the homeland or even sacred national commitments written in stone owing to their embrace by generations of officials who had gone before. Accordingly, any candidate for president had the right to loudly denounce Obama’s sanctions policy for the whole world to hear; and to promise to change or eliminate them in a manner consistent with a less confrontational view of America’s national interests. For crying out loud, the essence of constitutional democracy and free elections is that candidates for public office are free to criticize any and all government policies; it’s the very reason we have elections – for candidates to proffer choices and for the voters to choose among them. Yet to hear the MSM and Dem narrative your think that Obama’s idiotic sanctions were chiseled in the Constitution itself or at least Mt. Rushmore; and that any one who dared question their appropriateness and validity was at least a "useful idiot" doing Putin’s work unwittingly – or an actual agent collaborating with the Kremlin’s nefarious schemes to disrupt American democracy. We cannot make the last point strongly enough. What the Carter Page FISA application really proves is that candidate Trump’s broadly-based policy dissent against Obama’s post-2013 confrontationist policies on Russia was a prima facie reason for suspicion that his campaign was collaborating with the Kremlin. Otherwise, why would you wiretap a low level volunteer flunky in the campaign who by his own admission had never spoken with Donald Trump outside of the one meeting of Trump’s foreign policy advisory committee? In fact, that occurred in late March 2016 and was held for the purpose of damage control after the Donald had averred that he got his foreign policy advice mainly by watching TV! As it happened, however, virtually the entire GOP foreign policy establishment was then in the Never Trump Camp – so Trump headquarters virtually polled the phone book to get some names on a list that could be paraded before the press. Carter Page was one of the five members of then-candidate Donald Trump’s foreign policy advisory team that he named to The Washington Post editorial board on March 21, 2016. The announcement initially drew attention because Page, who owns (and is the sole employee of) the energy consulting firm Global Energy Capital, was a relative unknown…. Nevertheless, the facts of Carter Page’s Russia connection are straight forward and completely innocent. Moreover, a national security investigation worthy of the name could have determined that in a day or two by simply reading the newspaper and consulting the FBI closed case on the unwitting and harmless contacts he had had with Russian government personal during the 2012-2015 period. As FBI Special Agent Gregory Monaghan noted in an originally sealed complaint against several alleged Russian spies, Page had been the target of a recruitment effort around 2013, but never took the bait and was even ridiculed by his would be handlers as not one of the sharpest tools in the shed. In the complaint, Monaghan attested to how Page was the target of efforts by Russian Foreign Intelligence Service (SVR) agents Igor Sporyshev and Victor Podobnyy to recruit sources in New York City. According to the documents, Page and Podobnyy first met at an energy symposium in New York in January 2013. At this conference, Podobnyy gave his contact information to Page, who subsequently followed up with the Russian both by email and in-person to talk about energy policy. Page transferred unspecified “documents” to Podobnyy “about the energy business,” but Monaghan did not recommend that any charges be levied against Page. In fact, the section of the document discussing Page never characterizes him as a conscious spy or security risk, instead framing him as a victim of Sporyshev and Podobnyy, who expressly denied that Page knew about their status as intelligence agents. On or about June 13, 2013, Agent-2 and I interviewed Male-1 (Carter Page). Male-1 stated that he first met VICTOR PODOBNYY, the defendant, in January 2013 at an energy symposium in New York City. During this initial meeting, PODOBNYY gave Male-1 PODOBNYY’s business card and two email addresses. Over the following months, Male-1 and PODOBNYY exchanged emails about the energy business and met in person on occasion, with Male-1 providing PODOBNYY with Male-1’s outlook on the current and future of the energy industry. Male-1 also provided documents to PODOBNYY about the energy business. Over the following months, Male-1 and PODOBNYY exchanged emails about the energy business and met in person on occasion, with Male-1 providing PODOBNYY with Male-1’s outlook on the current and future of the energy industry. Male-1 also provided documents to PODOBNYY about the energy business. That’s it folks. There was nothing more to Carter Page’s alleged clandestine Russia connections than this brief encounter with some sketchy Russian operatives, and on that brief incident the FBI itself gave him a clean bill of health. The context for this boast of sorts is straightforward. Carter Page had been a stock analyst in the Merrill Lynch Moscow office between 2002 and 2007, and thereafter set out to peddle himself as an international energy expert and the proprietor of a two-bit international energy advisory firm (of which he was the only employee). In that capacity he bounced around various international energy conferences in New York, London and St. Petersburg and undoubtedly attempted to burnish his credentials by touting his contracts in Moscow. Even then, his invitation to speak at a Moscow conference in July 2016 resulted in nothing more than a follow-on effort by CIA operative Stefan Halper to entrap him. All the rest of the material in the FISA application is false, and was cycled from the Steele Dossier in three different ways. That is, it is cited directly in the application as fact and also through the Harry Reid letter to the FBI of September 2016 and the Michael Isikoff story in Yahoo News – both of which came via leaks from the Steele Dossier. The fact is, the Washington swamp is crawling with operatives who live in the lap of luxury advising foreign government about how to influence US policy. By some estimates that involves upwards of 20,000 high paid agents of Washington law firms, consultancies and other racketeering organizations which generate billings of billions per year. And some of the governments they advise – often being paid with money these government get from Uncle Sam – make ol’ Vlad Putin look like a saint. For instance, General Sisi in Egypt has executed more than 1,000 political enemies and imprisoned tens of thousands more from the $1.5 billion per year he gets form Washington. Even the most rapid anti-Russkie neocons have never accused Putin of doing anything close to that. At the end of the day, Carter Page was really nothing more than a small time Swamp Creature plying his trade in the international energy policy arena. Self-evidently, he had nothing to do with either stealing military secrets or advising candidate Trump on Russia policy. Instead, the hapless Carter Page was simply the human bait that Obama’s operatives dangled before a FISA court in order to wiretap the Trump campaign and attempt to nullify an unwanted outcome of the 2016 Presidential election. When it comes to a real threat to American democracy, it doesn’t come any bigger than that.